You may remember last year around this time I presented you with a challenge. 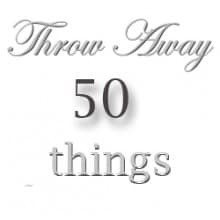 Throw away 50 things. Any 50 things. Get rid of them. Chuck em. Throw them in the garbage, give them to a friend, feed them to your children. But get RID of 50 things. 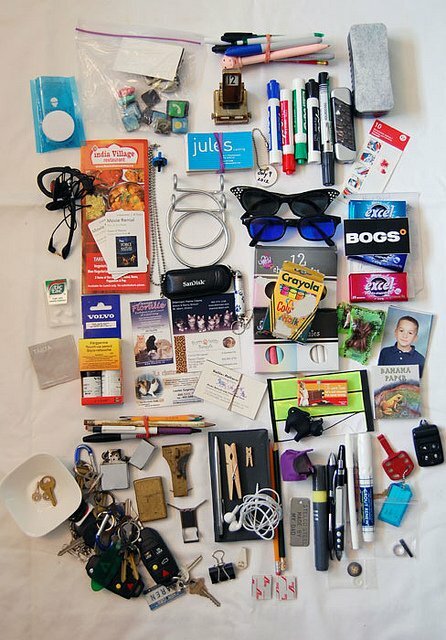 Last year my 50 things came out of one drawer alone. My junk drawer. The drawer that has no real purpose other than getting smashed full of things I have nowhere else to put. You have that drawer. We all have that drawer. I can probably list 10 things that are in that drawer right now. Paper clips of some sort. Keys you’re saving even though you no longer have any idea what they’re for. Take out menus for restaurants you never use. Phone numbers written on scraps of paper. Cigarette lighters even though you quit smoking 15 years ago. See? Pretty bang on I imagine. Since I felt like I *just* cleaned out my junk drawer there was no need to reattack that thing. ‘Cause I just cleaned it out. A year ago. Which in junk drawer years is like … yesterday. NO one cleans out their junk drawer more than once every 5 years or so. Only weirdos and freak shows do it more. I just did it. It couldn’t possibly need doing again. It’s a thing of beauty. Granted … that’s how it looked last year just moments after cleaning it out. Here’s how it looked today. And if we’re being perfectly honestly, it’s been this way since … probably about 10 minutes after its initial cleaning. It’s like a little junk drawer tornado lives in there, picking up junk from God knows where and dropping it into my drawer. I blame junk drawer tornados on the ozone layer. 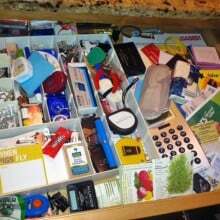 So clearly even though there were a million other things I could throw away for “Throw Away 50 Things Day”, I decided to organize the junk drawer again. The pared down contents after removing FAR more than 50 things. Some went straight in the garbage, some were dealt with (like the Starbucks iTunes cards), and some were pushed behind the cats’ dish so I could more easily ignore them. What remained was put back in the drawer, plus a few extra things that didn’t fit because of my drawer’s expanding waistline. Like that black memo book. That’s my little black book, where I write down my post schedules. Things like what posts going up on what day for the next week, what posts I have in mind for the future and little reminders about things I have to do. Funny. I know. I use a notebook, not a computer. I find it easier. January is the time to do this sort of thing. Clean up. Throw out. Organize. That’s why storage and organizing stuff is always on sale in January. Need big Tupperware bins? Now’s the time to buy them … they’ll be on sale just about everywhere. That’s why I’m dedicating a few posts this month to cleaning up and getting organized. Because once you do it you feel great. Lighter. Freer. Fantasticer. Plus it makes you feel smugly superior to everyone you run into for at least a week, so there’s that. Now that I have you motivated I’d like you to do it too. Throw away 50 things. 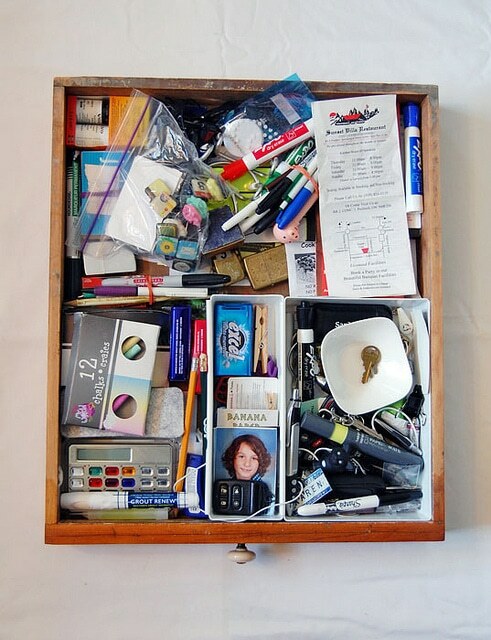 Do your junk drawer or old make up or your closet … or your whole house! Just find any 50 things that need to be thrown away and chuck em! If you send me pictures I’ll post the best ones next week. I just need a before and after shot and I’ll do the rest. Last year I got quite an assortment and if I remember correctly we all found looking at other people’s junk FASCINATING. Good luck and happy chucking. If I’d changed the letters to “f” in two of the words in that sentence it would be a completely different sentiment. by Organizing my Spice Drawer. Throw Away 50 Things.You did it! I have at least 6 junk drawers. I need intervention. I don’t have time for the junk drawer, I’m organizing my craft(junk) room. Good friends of mine taught me to rename the “junk” drawer the “useful” drawer. It kinda changes what you think belongs in there. And the basket organizers from Ikea make great drawer organizers. Oh well, just shows that I share your fondness for being smug and organized at least once each year. Cleaning out the bathroom junk is the BEST. You know some visitors look in the medicine cabinet? Its this whole creepy phenomenon. Thanks for the reminder and I am ON IT! I’ll throw away 50 things for sure. That’s a good idea. And I send you a pic. It will be an experiment compare my junk to other junk. What kind of difference are between canadian junk and european junk? What kind of things do you considere junk? Btw, a funny and good idea. Congratulations. And have a good year. Does my computer’s desktop count as a junk drawer? I collect just as much crap there. Barbara – Well, for one thing you give most of it to me. But before you give it to me, you take one long hard look at the stuff. If it is sentimental think about keeping it. When I redid my house from antiques to contemporary I kept a few of my favourite things and mixed them in with my contemporary stuff and they look great. Do NOT get rid of everything. One day you’ll miss it. If it’s a favourite of yours and always was keep it. Chances are one day you’ll pull it out again. As for the rest of the stuff, getting rid of it is easy. Check Kijiji or Craigslist for prices for stuff and you can sell them there as well. Museums do take donations. You can also sell stuff through consignment antique stores, or you can sell the stuff through auctions. Our town has at least one auction a week. Most areas do. There. That should get you started. 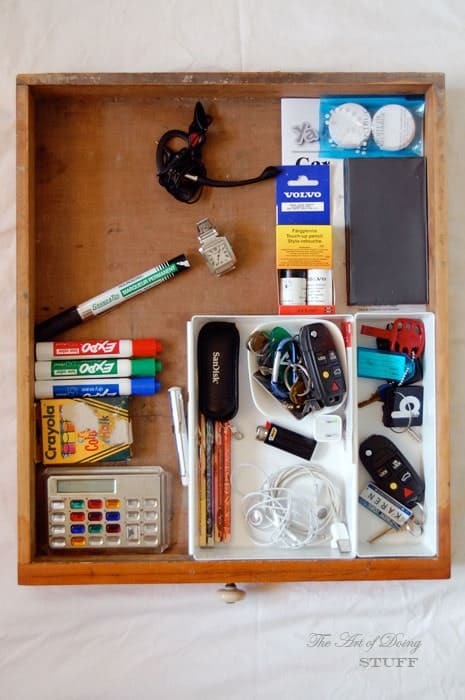 I have no idea how it has stayed this way, but the desk drawer is still neat & organized. Now, the rest of the drawers in the house…you are right, they need an overhaul. On a mission this afternoon I guess. Thanks, as if I didn’t have enough to do! Funny! I’ve been on a reorganize- throw crap out- since the 1st. But @Barbara I love crocks and rag rugs (wow- that would have been an entirely different sentence without the “c”!). How about an etsy shop? Love the banana paper btw! Seriously, I’m hypertensive so I’m not trying to make more work for myself. If *I* mess up my drawers by putting stuff where they shouldn’t be, *I* am going to have to do it all over again, and *I* am not having it. Amen. Good luck and happy chucking….. hilarious! Your post is good timing as a reminder to finish what I started last week! I read the book Throw out Fifty Things and was up to about 25 when I got side tracked. Back to it! It feels good to decluttter! It took an entire day just to file all the paperwork. There are befores and afters. Yep, theres the smugness. Don’t forget you can always put useful items on Freecycle or Craigslist. Sometimes it is easier to get rid of things when you know someone else needs them. And there is always Goodwill or recycle shops. Marilyn, in university, my friend used to keep an extra condom pinned to his bulletin board, pinned right through the middle of the package. You just never know when you need a spare … kid. I am way ahead of you this year, Karen. I have donated 9 garbage bags full of clothing, etc., and thrown out 6 garbage bags full of stuff. And I’ve only made it through 3 closets! 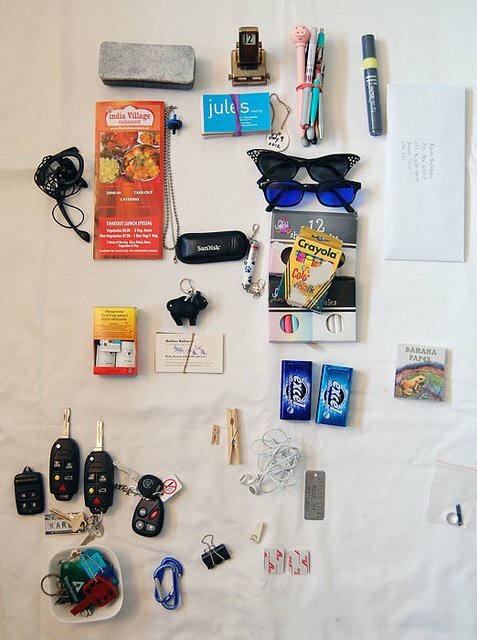 The only things on your junk drawer list in my junk drawer is keys. But mine are labeled so I still know where they go even if I’ve never used them. January 1st – time 9:30am…..changing from PJ’s to elegant PJ’s (sweats). Looking at my closet, totally disgusted. So, I spent New Year’s day (the entire day) TOTALLY reorganizing/reducing/reaaranging my closet…which moved into my dressers…. which moved to the baskets I keep under my bed holding other articles of clothing. In my book, it’s one o the best New Year’s days ever. January 7th – home sick with what could only have been food poisoning, although I don’t know what I ate to give it to me….went to put sheets away in my children’s bathroom linen closet and WHAM… COULD N-O-T stand another moment of it. I completely gutted it (raced up to Target – but don’t tell my boss) and stocked up on organizing bins, etc. It was a thing of stellar beauty when I was done. My 17 yr old daughter had over 15 boxes of feminine products. Now granted, they’re colorful and pretty to look at (http://www.ubykotex.com/products), but 15 boxes? Some were empty, some were full, some were in between. Sheesh. I found some rather “cute” clear storage containers at Target, that allowed me to line them up in pretty little rows. I’m working my way through the kids’ rooms with them one weekend at a time. Last weekend was my 13yo son’s room. We took 8 hours in the end, removed every single item from his room, cleaned, sorted and organised. He was a bit traumatised initially but now he loves his room as much as when we first decorated it for him! We sent 3 sacks to the charity shop, 2 sacks of rubbish and a box of books to his younger brother and sister. We also sorted out 6 crates of Lego and sold some. Phew! 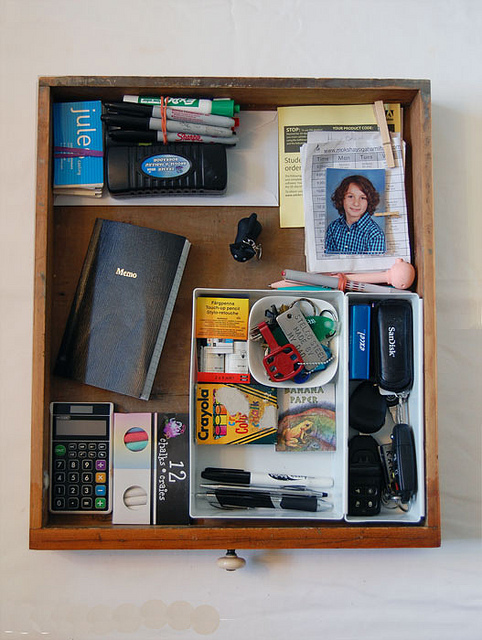 I have pared my questions about your junk drawer down to two Karen – first, who is the kid in the picture and how did he get top drawer billing and secondly, what is that weird red ‘key’ in the key dish? It looks like a public bath house locker key! I do respect your choice to remove the bejeweled calculator for a more sensible one and I hope you remember where you put that brick wall hook -it will drive you insane on the day you need it because you just KNOW you had one!! I didn’t do this last year….I will this year. Will send photo…maybe! Haha. Okay, you’re on. This weekend! Okay. What the heck!? I was all excited to do this project, and I knew the before picture was going to be just horrendous, so I was kind of extra stoked. Plus, I was going to do a blog entry on it, because who doesn’t want free topics to write about in their blog? But my camera battery was dead, so I decided to charge it, and then I got distracted and painted my nails. Imagine my horror upon coming downstairs and having my husband gleefully guide me into the kitchen, and opening the junk drawer with a flourish. He’d organized the entire thing! I hadn’t told him my plans, not even a small mention – he just happened to get the urge, and away he went. I think I’m going to file for divorce. Is “cleaned the junk drawer without asking” good cause for an annulment? OK Karen..I can do this again..cause it needs done again..Yeah..I remember how everyone was trying to claim everyone else’s junk..That was fun!! Karen – GE is having a big sale!!! Go to their website and look at your new kitchen!!! Seriously—you are a gas!!! I’m so glad I read through the comments today, I LOVE evil minded persons like you! Wanna be my friend? Every store I went to over the holidays, I saw people carrying stacks of giant totes out the doors. Maybe if they threw 50 things away they wouldn’t need the totes! I may be the only person in the world who doesn’t have a junk drawer. Last year, you inspired me to take a week off work and reorganize my entire office/spare bedroom/craft room. My husband might argue that I don’t have a junk drawer because I have a junk craft room, but he doesn’t know what he’s talking about. There is a spot in that room though where we pile all the crap that we plan on getting rid of. It’s sort of taking on a life of it’s own and our son has recently started pulling stuff out of it again. That is what I need to tackle. Been there, done that. Way more than 50 things. Let’s see 2 boxes and 3 garbage bags when to charity. Then 2-3 garbage bags went to the dump because they were not even donate-able. Still going, I’m a purger first and foremost. Unfortunately my six-year-old is showing hoarding tendencies. aaaaahhhhhh! Okay, so I’m the freakshow that unclutters my junk drawer a few times a year. I have to, because I like to be organized. But more importantly because my husband’s idea of “tidying up” when company comes over is to shove everything from the first floor in that drawer, including that day’s mail. I’ve found bills that needed to be paid ASAP sitting in there for 3 months. That drawer would haunt my dreams if I didn’t muck it out occasionally. Also, I keep my takeout menus in one of those slim, plasticky file folder thingees with about 6 categories: italian, chinese, indian, other asian, and a couple of others that made sense. I put the menus in there as they arrive and then each time I order I throw out the old ones from that category. Don’t hate me because I’m beautiful…ly organized. That’s not why I hate you. is it because I AM beautiful? Now, I know how and where my junk drawer gets into the condition it is in. I must have a Jeannie B. in my life. Sneaking into the kitchen with the baggie in the dark and shoving it into my drawer. There are things in there I have never seen. Ask others in the house, they don’t understand it either. Well, I feel better, just have to catch the baggie toting intruder, and make them take my stuff. Well, I am in the middle of moving so I have been throwing out about 50 things every evening. I will try to get an interesting picture. But either way, I am definitely up for the challenge! May be a silly question, but how do we send you pictures of our befores and afters? Hah! Not silly. Silly of me to forget to put my address in the post. I’ve rectified that now. I’ve had a stroke of genius. If I post this second comment, there will be 50 comments on this blog post. D’you see where I’m going here? what a great proposition ! I can’t wait to get home and follow up on this. We have 3 kids and we live in a 3 bedroom Cape – and not one of the BIG Capes, but a smallish Cape. We don’t have the room for half of the “stuff” that we have…so time to throw it out ! Looking forward to the weekend. Thanks ! Thanks for the inspiration – today I got rid of 3 grocery bags full of paper of all kinds – old envelopes, advertizements, miscelaneous stuff from the mail. There, I feel much better! I toss out 3 bags full of trash every other day…. does that count? We just moved from a pair of bedrooms in a 4 bdrm house with hubby’s parents, and our storage unit that was PACKED from floor to ceiling, so we’re throwing out old junk every day. The organizing thing doesn’t work for me. If I see something I no longer need, & fail to throw it out RIGHT THEN, it’ll gather dust for the next 18 months, because I forget I wanted to get rid of it, then I forget where it is because I put it up so I won’t forget to toss it out with the rest of the junk that’s going to Goodwill. Thanks for the kick in the pants. I am embarrased to say that I did not know that January is ‘organization month’ or that any month ws considered so, but it makes perfect sense. New Year, start clean and fresh. But I do now. My major problem is mail and how long to keep documents. 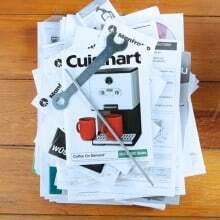 I just googled it (took a few tries to get what I really needed) and found some good quick articles on About.com regarding Organizing Mail, How long to keep Documents, What to Shred, etc. And the links all branch off from here: http://personalorganizing.about.com/od/PaperManagement/tp/How-To-Manage-Mail.htm. Some how it seem like the junk doubled the next year for me after I tossed it. djeeee…. you have the same car keys as me… jeeeej! Good! Send pictures! No pictures? Ah well. ~ karen! Please. My entire apartment is one big junk drawer. 😛 My neat and tidy dining table from last year lasted about a week into 2012 (or whenever it was that I last cleared it off). I need to do this, like, right now. Haven’t read your blog in months. Have it bookmarked, though, and popped in for another look this morning. What a surprise to read this post now, when I just did another closet purge last night! I didn’t count anything, of course. . .does each hanger count as a separate thing? If so I am willing to bet it was at least 50 things! They went to a friend who (don’t panic) who will pass them on to people in her church who can really use them. And – bonus – I found an item I bought a couple of months ago that I can return because the price tag is still on it! Store credit to buy my son a christmas gift – woohoo! The funniest part of the post about the kid with the snow shovel was when you posted your intention to unsubscribe for that sad, pathetic lady with absolutely no sense of humor – what was her name? . . .Doris? As in, go ahead – but don’t bother because I will do it for you. . . Oh, I laughed. Not sure if they were the same person. . . I am depressed a lot of the time (lost my husband a while ago) and I thank you and your fans for the gift of laughter. Am I REALLY not the only person who saves bits of paper with phone numbers on them? Wow! Amazing. . .I feel less weird now. Also the above-mentioned close purge was two paper grocery bags full. . .since there are people who count these things.